Fans of U.S. cycling have a lot to look forward to in the coming season. Young riders are breaking into the elite levels of the sport, and some are waiting in the wings to win big in 2019. Who are the key players to follow? Let’s roundtable! Fred Dreier, @freddreier: I was floored by Sepp Kuss’s dominating victory at last year’s Larry H. Miller Tour of Utah, and several weeks later I was again impressed to see him ride so strongly as a domestique at the Vuelta a España. Both performances signified a huge step up in form for Kuss, who is a bonafide American ubertalent. So what can Kuss achieve in his sophomore year? That’s the story I’m following in 2019. I’d love to see Kuss do more valuable domestique work at a grand tour for Jumbo-Visma’s GC riders. Could he shred the peloton on the Giro’s climb up the Gavia Pass? And I’d really love to see Kuss take a leadership role at a one-week stage race, such as the Amgen Tour of California or the Volta a Catalunya. Sepp’s a star, and this year we will learn how bright he can shine. Spencer Powlison, @spino_powerlegs: By now you’ve probably heard of Kate Courtney, the first American to win an elite XC world championship since Alison Dunlap in 2001. The 23-year-old has clearly arrived. Now what? I will be curious to see how she handles two key changes this coming season. First, she’ll have the pressure of wearing the rainbow jersey. So far, Courtney has proven up to the task of performing on the world’s biggest stage, winning not only worlds but the prestigious Absa Cape Epic stage race earlier in 2018. After she won worlds in Switzerland, she said the title would give her motivation to keep pushing. Let’s hope that is the case. The second question I have is how she’ll adapt to an entirely new team in Scott-SRAM. She hopes the expertise of Thomas Frischknecht and Nino Schurter can help her become a consistent top-five finisher in the World Cups. And in 2020, she’s aiming for a spot on Team USA for the Olympics. Sometimes riders need time to readjust to a new team, but other times, it provides fresh motivation for them. When the World Cup opens up on May 18 in Albstadt, Germany, we will start to get some answers. Chris Case, @chrisjustincase: If you run down Coryn Rivera’s results from 2018, a few wins stand out: a road race national title; a stage and the overall win at the OVO Energy Women’s Tour. It’s not a long list. If you take a closer look at her results sheet, however, you’ll see a number of second- and third-place finishes, top-fives, and results that show she was in the mix but didn’t have that final one percent — or that dose of luck — to send her to the top step of the podium. That’s the nature of being a sprinter. Thing is, she has proven that she has much more than just a closing kick — look no further than her 2017 Flanders win for evidence that she can get over climbs, grit her way into the right places, and finishing off long days when the pressure is on. I predict that in 2019, Rivera will close the deal more often than not. The California native had a breakout season in her first year with Team Sunweb in 2017, winning Trofeo Alfredo Binda, Tour of Flanders, RideLondon Classique, and the team time trial at the world championships. She may have had a slow start to the 2018 season, but by the time the summer rolled around, Rivera was back to her winning ways. Most notably, after winning 70-plus national titles as a junior and U23 rider across multiple disciplines, she secured her first elite stars-and-stripes jersey in the road race at the U.S. pro championships. It was the defining moment of her season. Because Rivera often finds herself mixing it up in sprints, the difference between a 10-win season and a three-win season is a matter of inches. Look for her to come into the 2019 season swinging, in an attempt to build all-important confidence for the classic races. She’ll want nothing more than to add to her tally of big wins while wearing the American national champion’s jersey on European soil. Dane Cash, @danecash: Neilson Powless made his WorldTour debut alongside compatriot Sepp Kuss last year with LottoNL-Jumbo. Both riders pushed through the challenges of adjusting to racing at the top tier, and then the light came on for Kuss, who delivered a breakthrough performance at the Tour of Utah. I’m wondering if Powless takes his turn this season. Stage wins at the Baby Giro and the Tour de l’Avenir put Powless on the radar from an early age. 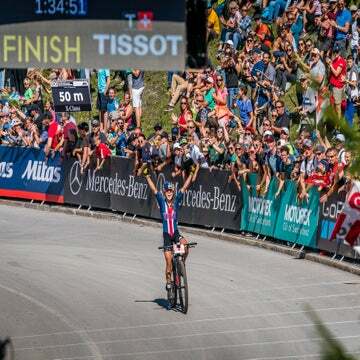 The 22-year-old has already shown some promise against European pros, riding to ninth place at the Settimana Internazionale Coppi e Bartali and seventh place at the Tour of Britain in 2018. He looked good in a support role in Utah as well. Powless may not have had a marquee win up to point to just yet, but the positive signs are there. He has the talent, and his Jumbo-Visma team has a track record of gradually developing young riders into stars. Here’s hoping Powless is the next product that proven system turns out. Fred Dreier, @freddreier: Look, I’m greedy and thus I will name yet another American rider to watch this year: Brandon McNulty. I’m watching McNulty because he’s America’s top U23 rider, and at age 20 he’s poised for a breakthrough victory this year. Will it come in the U.S. scene, or overseas? I have no clue, but I will be watching. Last year McNulty took the unofficial “best domestic rider” prize at the Amgen Tour of California by finishing seventh overall. He’s chosen to once again race with Rally-UHC, and will likely be given leadership duties at some stage races. And then there’s the U23 time trial world championships, where McNulty is always a rider to watch.